Grant me permission to overshare? I feel as though we are all friends now and the more you visit our website, the more you read our blogs and the more you get to know us. I mean … we are pretty much besties! I have been SO super bloated. I have been carrying around this swollen, firm bloated belly that is incredibly uncomfortable and not really the most attractive accessory to your outfit. have you ever felt that? No one enjoys that feeling. After a few weeks of this bloat business, I decided it was time to do some research and do something to help my digestive system and beat the bloat. 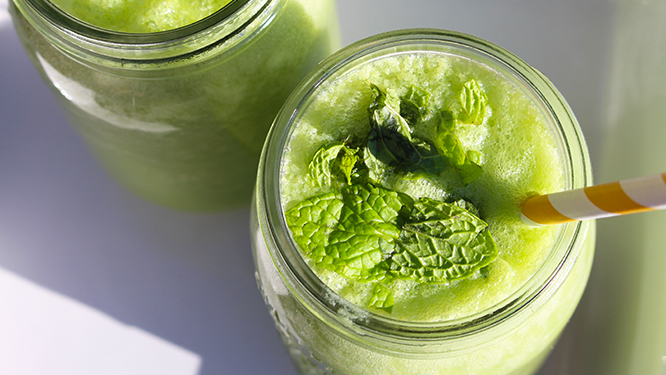 Drum roll please …..
Bloat Buster Smoothie Recipe to the rescue! This smoothie is a great blend of natural anti-inflammatory ingredients to help reduce that bloated and uncomfortable feeling we are all familiar with. Let me share with you why the ingredients I use in this recipe are super kind to your belly bloat. These babies belong to the squash family and are awesome because they are mostly water – in-fact they are 95% water which means they can help you stay hydrated during the warmer months and they are low in calories but still rich in vitamins and minerals. They also contain a good amount of fibre which we know is important for cleansing our bodies and maintaining a healthy digestive system. Cucumbers also have a “cooling” quality. I’m sure you have seen them used topically at those fancy day spas to help reduce the swelling and puffy eyes that we get from our over stimulated lifestyle, ingesting them is just as beneficial. Quite possibly one of the greatest foods out there! They are rich in pectin and fibre, which helps to aid digestion and remove those unwanted toxins from our bods. They also work like prebiotic, which stimulates the growth of good bacteria to help keep those bellies healthy! Annnnd they are a great source of potassium which helps regulate our sodium levels. Too much sodium can cause fluid retention which is another good reason to bust that belly bulge. One of my most favourite herbs in the world! Mint can have benefits of an anti-inflammatory topically and internbally and is often used as a natural remedy for gas and bloating. It also really helps with the tummy aches and pains that come with those unwanted bodily functions thanks to it’s anti-spasmodic nature. The ginger ninja has long been used as a natural therapy for gastrointestinal symptoms. It helps reduce intestinal gas and contains potent anti-inflammatory compounds called gingerols, which can help with things like swelling, arthritis and muscular aches and pains. It’s also used world wide for treating nausea and morning sickness so it definitely helps to calm those sensitive bellies. This recipe is super light on the belly and on the palette. It’s super tasty and super refreshing! Put all the smoothie ingredients into the Vitamix 2L container in the order listed and secure the lid. Select Variable 1. Turn the machine on and quickly increase the speed to 10, then override to High. Use tamper to effectively press the ingredients into the blades if required whilst processing if necessary. Blend for 60 seconds or until desired consistency is reached. Stop the machine, poor into your glass. Add some freshly grated ginger as a garnish or some fresh mint chopped up to top it off.